In this page, we will look at the Rattlesnakes. Several days after a rattlesnake baby is born, it sheds its skin for the first time and a button is left on the end of its tail. Each time the rattler sheds its skin—which happens every three or four months—another hollow rattle segment is added to its tail. When the snake shakes its tail, the contraction of special "shaker" muscles in the tail causes these segments to vibrate against one another, making the rattling noise (which is amplified because the segments are hollow). The longer the rattle, the louder the noise. 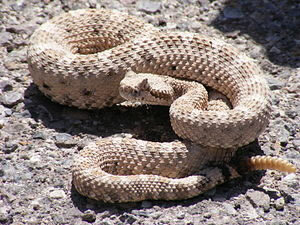 A wild rattlesnake will usually have no more than eight or nine segments because they get brittle and break off. Rattlesnake fangs are connected by venom ducts to large poison glands near the outer edge of the upper jaw, towards the rear of the head. When the rattlesnake bites, muscles on the sides of the venom glands contract, which squeezes the venom through the ducts and into the fangs. Rattlesnake venom contains components designed to immobilize and disable the prey, as well as digestive enzymes which break down tissue to prepare for later ingestion. Have a look at this video of Rattlesnake vs Squirrel.